Cover: On the front side of the book, the picture of Ramakrishna is a painting by a Western Admirer, Mr. Frank Dvorak, and so also is the picture of the disciples of Ramakrishna, which is a painting by another Western Admirer, Swami Tadatmananda. About the Author Mr. Gopal Stavig Ph.D. (Sociology) is based in Southern California. He has been closely associated with the Vedanta Centre of Hollywood for about five decades and is a disciple of the late Swami Prabhavananda. He has published more than sixty articles in leading journals, over half on the subject of religion and philosophy, the rest in the areas of social statistics, epidemiology and demography. He was employed as a state government researcher in hypertension, and a University instructor in statistics and social research. Sri Ramakrishna had once said, “I felt I was in a far—off country where people were of fair complexion. They were different from us and spoke a language I could not understand. As I was wondering about the vision, the Divine Mother revealed to me they too would follow my teachings. How sincere their devotion was!" By “people of fair complexion”, his reference was, in all probability, to the westerners. During his lifetime some westerners had paid visit zo him and expressed their admiration for his life and teachings. Since his passing away in 1886, their number has been seen to be steadily on the rise. Similar has been the case with his monastic disciples, Swami Vivekananda and others, who attracted the attention of the West with their purity of life and nobility of thought, self sacrifice and service to humanity. "Throughout she last century we find a gradual increase in the number of westerners entering into the stream of Ramakrishna-Vivekananda and Vedanta thought. This development is important not only for the Ramakrishna and Vedanta Movement but also for the chroniclers of the conceptual changes witnessed in the western society in the 20th century, as has been stated by the Editor in his “Introduction”. As a result, there has been an urgent need to bring these admirers together in a single volume and document information about them. 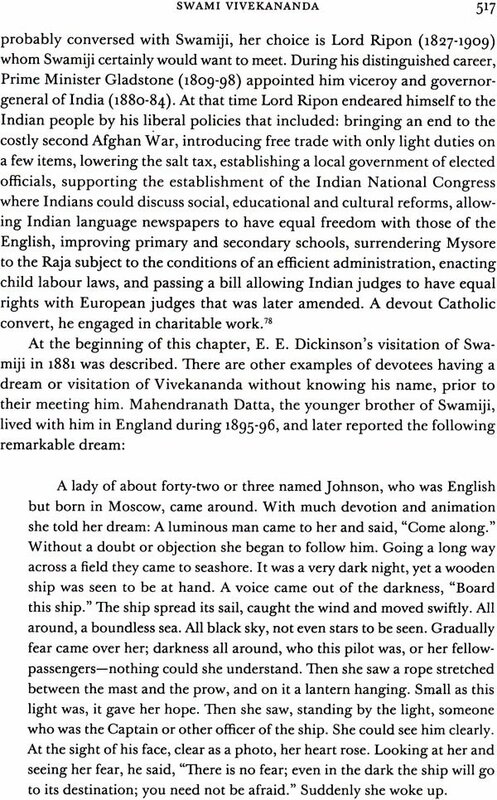 We are extremely delighted that that need has been fulfilled in the present book Western Admirers of Ramakrishna and His Disciples. It is a classic work of research by Mr. Gopal Stavig Ph.D. who is based in Southern California. He has been closely associated with the Vedanta Centre of Hollywood for about five decades. A disciple of the late Swami Prabhavananda, he has presented massive information in this book, Among the around 600 persons dealt with herein, there are some who had directly come in touch with Ramakrishna and his disciples, a large number of persons who had only read about them and had been impressed by their lives and ideas, many who had made literary contributions, and also many more who had only indirect associations. We admit, therefore, that some of them arguably do not deserve to be included in the category of “admirers”, in the literal sense of the term. When there are varying degrees of “association” between persons, it becomes difficult to categorize them as “admirers” and as mere “acquaintances” by drawing a strict line between them. Yet, there is no denying the fact that this book is a meticulously researched out documentation of a large number of persons, mainly westerners, associated with Ramakrishna and his disciples and their thoughts, directly or indirectly. Their background and vocation are presented in brief, and also, in most of the cases, the accolades they showered. All this makes this work unquestionably important, both for the scholars interested in studying the western mind coming in touch with these spiritual luminaries as well as for the ordinary devotee. For the former the book is a mine of information presented precisely, and for the latter, it is an inspiring account of western admiration for Ramakrishna and his disciples and Indian thought. The book is divided into four parts. Part I deals with “Western admirers of Sri Ramakrishna”, Part II with “Western admirers of Sri Sarada Devi”, Part III with “Western admirers of Swami Vivekananda”, and Part IV with “Western admirers of the other disciples of Sri Ramakrishna”. Except in Part II, in every Part the admirers are classified in different chapters according to their vocation, e.g. 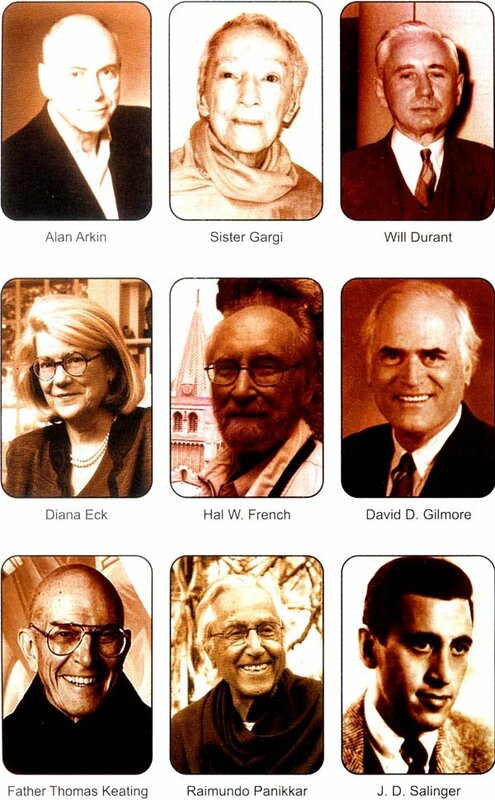 biographers, translators, devotees, supporters, religious leaders, professional writers, musicians, etc. This systematic arrangement facilitates easy access to the personalities the reader wishes to know about. The work is copiously referenced, letting the scholars make further probings. At the end of the book the author has supplied seven “Appendices” which we are sure would be of much help to the scholars. Swami Shuddhidananda of Advaita Ashrama thoroughly edited the work and also wrote an insightful “Introduction”. Brahmachari Yogadachaitanya (Alok) gladly undertook the task of carefully proofreading the manuscript and helping the Editor in various ways. We are thankful to both for their labour of love. This year the Government of India has constituted a National Committee to chart programmes and core modules to spread the life-building message of Swami Vivekananda during his i5oth birth anniversary due in 2013. Bringing out books dealing with the Swami is one of the areas which will derive considerable attention. In this light we take the publication of the present book as a beginning of our efforts in furtherance of this aim. We expect the book to be well received and chalk out for itself a place among the other scholarly works on Ramakrishna and Vivekananda. This book is dedicated to the found memory of my guru Swami Prabhuavananda. I am extremely thankful and indebted for the excellent job Swami Shuddhidananda of Advaita Ashrama has done in undertaking the editing of this book. I also appreciate the confidence that Swami Bodhasarananda, the President of Advaita Ashrama, has shown in this manuscript, and the encouragement I received from Swami Sarvadevananda, the Assistant Minister of the Vedanta Society of Southern California. In addition, I want to thank Brahmachari Jnana Chaitanya, a monastic member of the Vedanta Society of Southern California and the diligent curator of the Vedanta Archives Research Library, for giving me access to the valuable collection of older issues of the Prabuddha Bharata, Vedanta Kesari, Bulletin of the Ramakrishna Mission Institute of Culture and Other literature that has significantly enhanced the quality of this book. 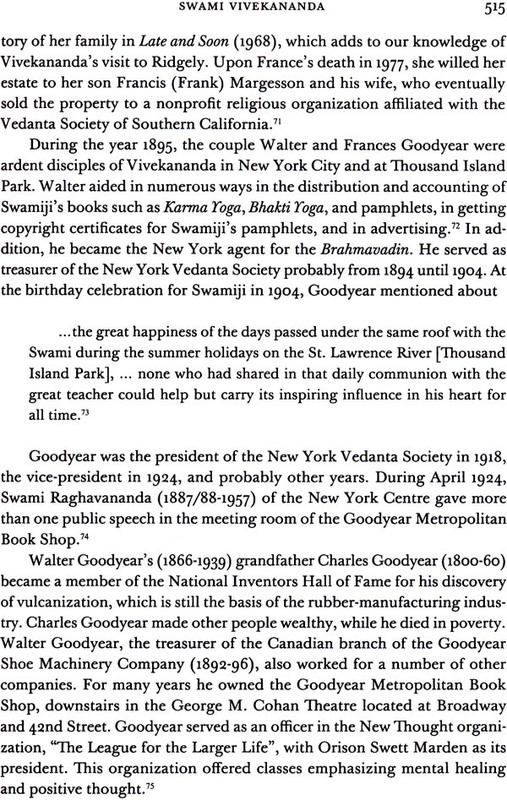 Writing a history of the Vedanta Society of Southern California for the Vedanta Archives also proved very beneficial for me, in getting a better idea on how to present the material in a way that would be appreciated by the readers. Lastly, university research librarians, particularly at U.C.L.A., guided me to databases that produced a great deal of useful information that appears in the book. Though a major portion of the present book deals with the western admirers of the disciples of Sri Ramakrishna, it would be fitting to start the book with a brief narrative of Ramakrishna’s life, for, he is the mainspring from where his disciples emerged and later dazzled the western world with their spiritual eminence. I-us short lifespan of fifty years is symbolic of the story of India’s spiritual culture and civilization of unknown antiquity. And India being “the cradle of human race”, it is also the story that reflects the spiritual aspirations of the entire human race of all times. In the modern period his life has been the fountainhead of many of the positive trends seen in the fields of religion and thought. The protagonist of this story with such global appeal was, paradoxically, born in one of the remotest obscure hamlets of Bengal in India. Ramakrishna was born in 1836 in Kamarpukur. 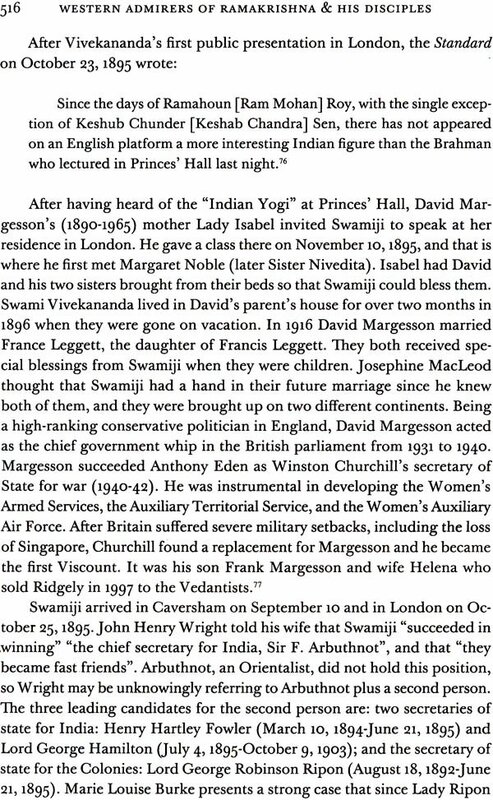 His parents, Kshudiram and Chandramani Devi, were pious. The people of the village were deeply impressed by their exemplary lives. Due to their devotion to their family deity and kind-hearted gesture towards all those who came to them for succour, the villagers held them in high esteem. Though poor, they were unstintingly charitable. And that was also the time when the boy was unconsciously getting ready to start off on the different paths to ecstasy and enlightenment. But his path was not to be without difficulties. The untimely death of his beloved father in 1843 made his childhood particularly poignant, leaving his tender heart bruised. In and through this sad event glared the transiency of earthly life. He started frequenting a neighbouring cremation ground and used to remain there for long hours absorbed in deep thought. Even as his mind soared high in search of the eternal, he could not disregard his duty towards his dear mother and did everything possible to lessen her grief and burden. Nevertheless, the deep undercurrents of apathy for worldly pleasure often drew him towards wandering monks arid seek their company. When he was nine years old, he was invested with the sacred thread. According to the Hindu custom, the newly initiated was supposed to receive his first alms from some relative or at least from a Brahmin. But Gadai had the pluck to overrule the prevalent custom and accept the first alms from a low caste woman. This woman had earlier prayed to him to allow her the privilege of giving him the first alms. Moved by her earnestness, he had agreed. And when the time came, the little boy stuck to his words and defied the citadels of orthodoxy and timeworn traditions of his village. Through this act he was inadvertently sending out signals to his surrounding world that the walls of caste-prejudice need to be razed to the ground and the dignity of every human being upheld. The boy, and his life, had already started displaying the traits of his being a teacher of humankind, come to remove the barriers between man and man. Gadai had an aversion for school learning, and especially for mathematics. He would skip his classes and pass most of his day with his friends in various sports. They would enact scenes from the life of Krishna and often Gadai would go into deep trance. He derived pleasure listening to the epics and stories from the Indian mythology, which, iii urn, spurred his spiritual aspirations. To realize God now became the one goal of his life. Form apart between his wish to renounce the world and his duty towards his widowed mother, he bowed down in surrender to his Lord and waited in eager anticipation. Years rolled by, and destiny brought him to Calcutta to help his elder brother Ramkumar. Gadai was entrusted with priestly duties, which he gladly discharged. But here too he displayed his gross disinterestedness for studies. Annoyed with his apathy towards academic pursuits, Ramkumar admonrued him, upon which the young Gadai remarked, rather characteristically, Brother what shall I do with a mere bread-winning education? I would rather acquire wisdom which will illumine my heart, and getting which, our is satisfied for ever.” In these words the boy had a point to make, that idea was too precious and sacred to be squandered on dead-end pursuits. It was now clear to him that, unlike the multitudes, his was the pathless path towards God realization. The turn of events now brought the young Ramakrishna to the precincts it of the Dakshineswar Kali Temple, which was founded in i85. The silent and congenial surrounding of the temple-garden was just the setting he needed you pursuing his spiritual goal. Soon he was assigned the task of decorating the image of Kali. He discharged his duty with all the devotion of his heart null spent rest of his time singing the glories of the Divine Mother, which want to leave the listeners spellbound. His ingenuous behaviour and fervent devotion soon favoured him and he was made the priest of the Radha-kanta Temple, and later the chief priest of the Kali temple. But there was some thing ominous waiting for him. The death of his brother Ramkumar at this time came as a rude shock. The transient nature of the world now began to haut him as never before. His soul, now on fire, began to plunge into itself in search of the Eternal. Divine Mother now became the polestar of his life whom he depended on for spiritual illumination. For him her image was not mere inert stone but one pervaded by consciousness. Because of this intensity of his devotional mood, he could no more conduct the formal worship of the Divine Mother regularly. His state of mind and behaviour at this time was beyond the ken of ordinary people, and many considered him mad. At the same time there were also a few who were Charmed to see his God-intoxicated state and for whom he became an object of admiration and reverence. But approbation or condemnation, he was indifferent to these worldly evaluations, and all his energies remained converged on his Divine Mother. At last the day arrived when the bounds of his endurance gave way. Possessed by the all-consuming fire of spiritual longing and unable to bear his separation from the Divine Mother, he rose to put an end to his life with the sword hanging on the wall of the shrine. Just then the Mother revealed herself to him and he fell unconscious on the floor, He didn’t know how that day passed and even the next. He was inundated with undiluted bliss never experienced before, and he felt the presence of the Divine Mother. From now on the Divine Mother became a living reality for him, just like any other living being. The formal ritualistic mode of approaching the Mother came to an end. lie became the Mother’s child, conversing with her, feeding her, and relying on her for everything. After having realized God in the form of the Divine Mother, now his heart yearned to see God in the form of Rama. Accordingly he commenced his spiritual disciplines and, within a short time, had the vision of Sita, Rama’s Consort, and also realized Rama to be an incarnation of God. With this ended the first phase of his spiritual practices and experiences. 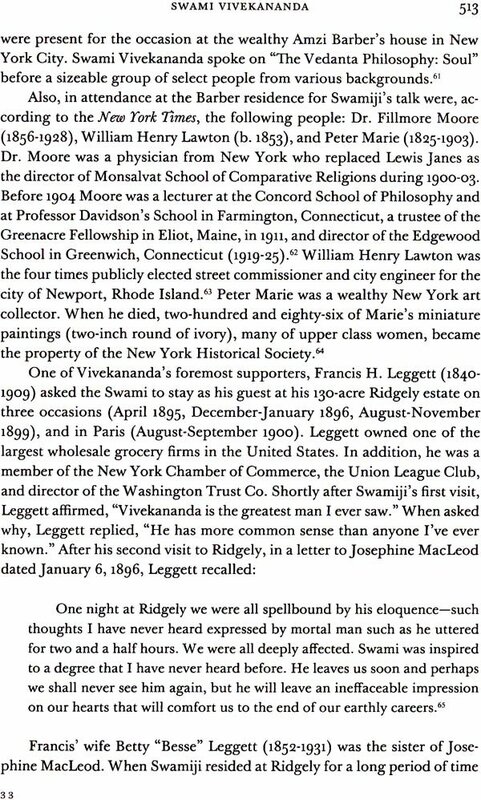 Ramakrishna was now twenty-three years old. His indifference to worldly life caused much worry to his mother. Over and above this, when the rumor that her son had gone mad reached her, she became all the more anxious, She now set about to get him married thinking that it would rouse his interest in worldly affairs and cure his mental imbalance. And this marriage, as we shall see, was going to be of the most unusual kind. A bride was found in the village of Jayrambati. She was a five-year old girl, Saradamani. After the marriage ceremony was officiated in Jayrambati, Ramakrishna returned to Dakshineswar. I have practiced all religions—Hinduism, Islam, Christianity, and I have also followed the paths of the different Hindu sects. I have found that it is the same God towards whom all are directing their steps, though along different paths. In a single life he lived, as if, the religious life of an entire race of several millenniums. He had a mission to accomplish—to spread the universal message of harmony of religions, divinity of everything, and solidarity of human we. His advent, as we shall see, was to eventually speed up the emergence him modern trends in the fields of religion and thought, and these areas were to slowly undergo a change. 11w foremost among his disciples was his wife, Sarada Devi, who all these years lived in her native village with her heart yearning to be at the ‘side of her God-intoxicated husband. The young nineteen-year-old woman now reached Dakshineswar to serve him. This was in 1872. Though having attained the acme of spiritual experience and being absorbed in God, he, like any other dutiful husband, cordially welcomed her and made arrangements Ii her comfortable stay. The couple stayed in the same room and shared hr same bed for about eight months. But they were the most exceptional couple ever In have entered wedlock. Their marriage remained forever unconsummated on the physical plane, and they attained union in the Divine, making their relationship a monument of platonic love. The young lady in no way lagged behind her husband in purity and spiritual fervour. In fact, Ramakrishna looked upon her as the Divine Mother in human form and offered the results of his twelve-year long spiritual exercises at her holy feet in a formal worship. 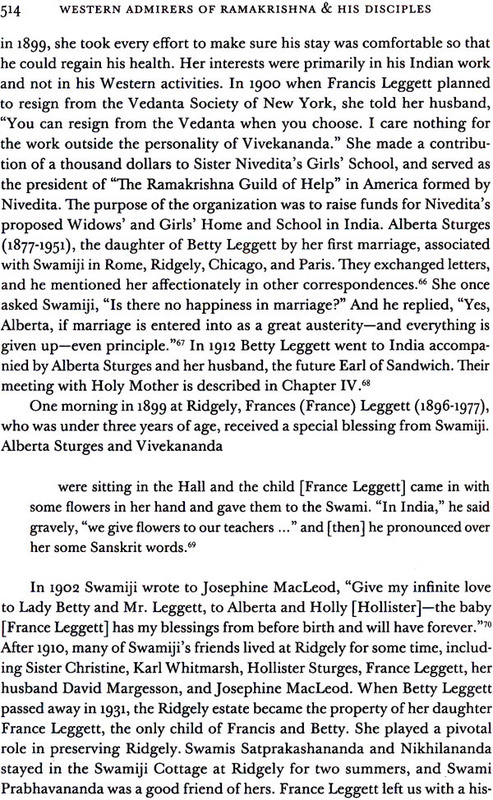 She was to become in future the holy Mother of the Ramakrishna order.